The carpentry team begins the next phase of the construction after reviewing and accepting the completed foundation checklist. Once they start, responsibility shifts to their shoulders and any problems discovered once framing has started will only be complicated by delays and change orders. The framing begins by sealing the foundation stem walls, adding moisture and vapor barriers, setting perforated foundation drains, and placing filters over washed gravel to control ground water and wet soil conditions. Moisture protection has to be completed so that the foundation can be backfilled immediately after the floor joists are in place. 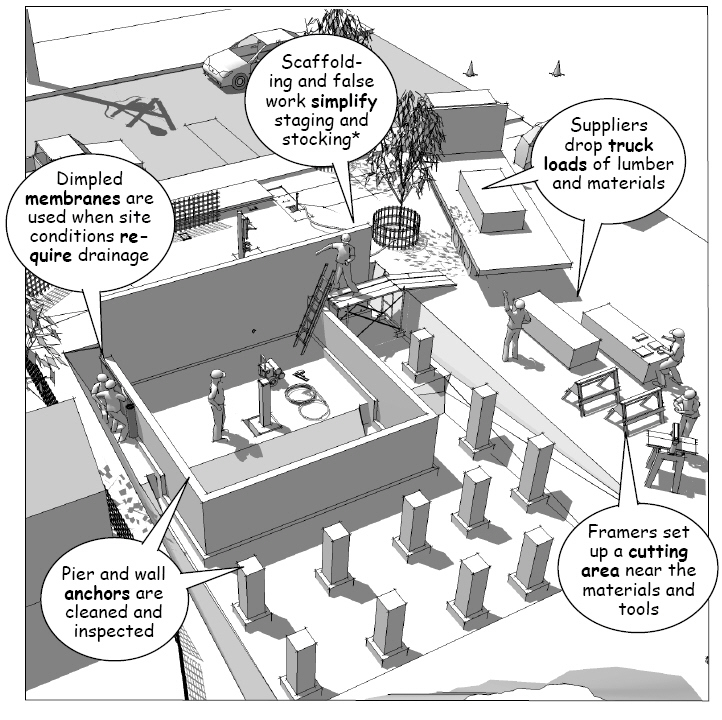 To minimize petroleum based coatings, dimpled membranes are used to cover the foundation walls with a high recycle content HDPE material (See Superseal Construction Products). 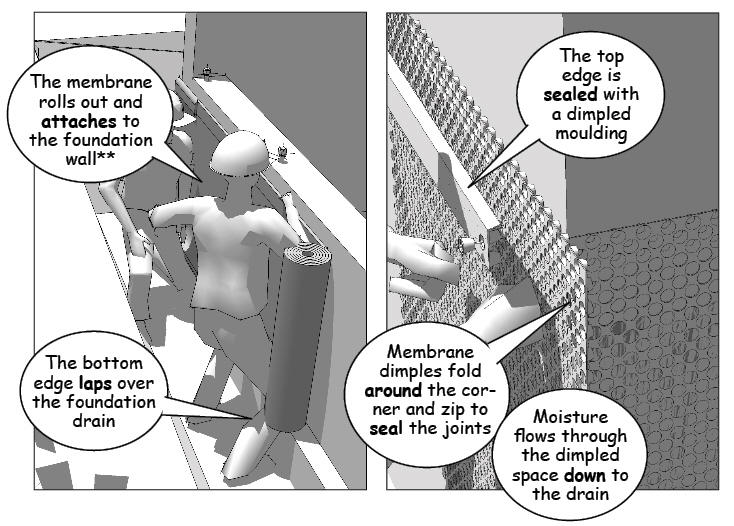 The membranes zip together to form a barrier against moisture that would otherwise penetrate the stem wall. 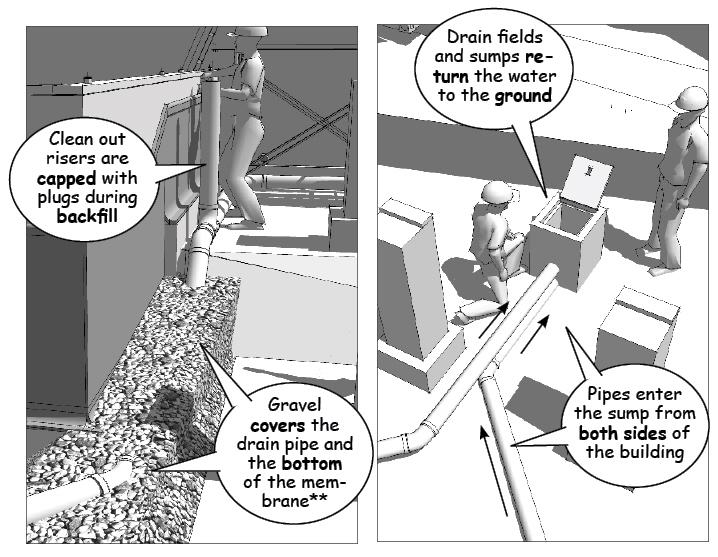 The perforated drains are located near the bottom of the foundation footings to channel accumulated moisture to drywells, drain fields, or storm water systems. If flexible drain pipes are used, they’re laid over a compacted base to keep them from settling and clogging once the backfill is in place. Washed gravel is shoveled over the perforated drains and covered with fabric filters just before backfilling following national standards for moisture control. Mechanical and plumbing supply and drain lines, electrical cables, and grounding rods are installed through the foundation walls and into the crawl space before the framing restricts access to the area under the floor. These lines penetrate the stem walls through special pressure sleeves and are bedded in trenches according to utility specifications. While the foundation is open, the crawl space should also be bedded with sand for later servicing by plumbing and electrical contractors or if there’s a basement the floor is prepared for a concrete slab. Carpenters begin by cleaning the anchor bolts and top of the stem walls in preparation for the sill plates. 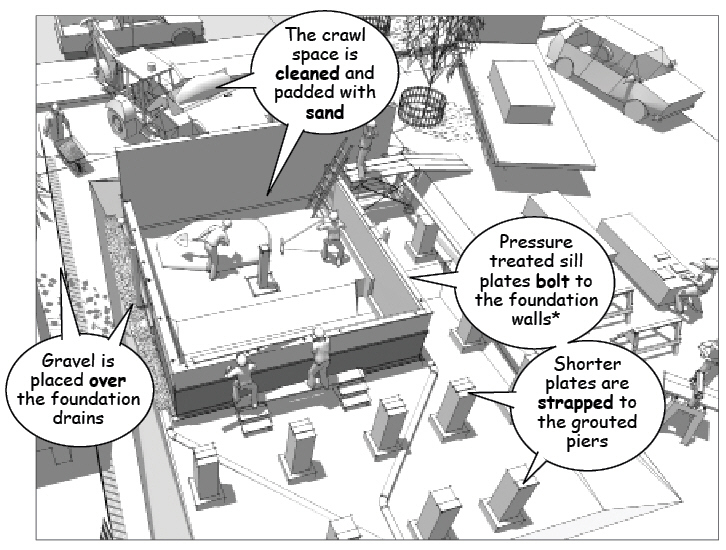 For safety, the site is cleared of all scraps, tools, and unnecessary materials before staging the work areas and equipment to support the framing team. 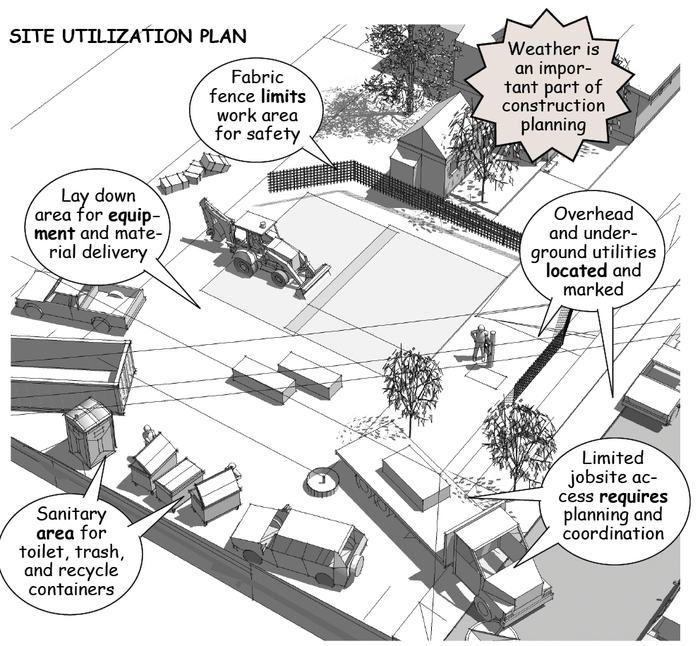 For complex projects, knowledgeable contractors will use the site utilization plans (SUP) made during the preconstruction phase along with a simple deconstructible construction model to anticipate daily tasks and save time and materials. 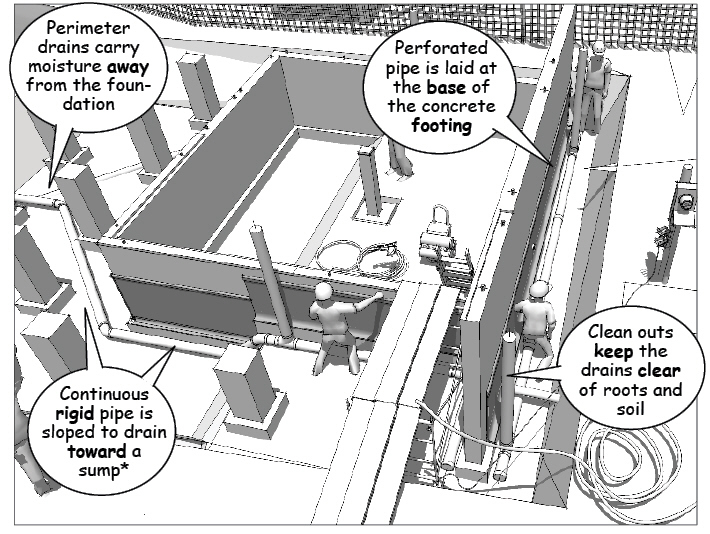 The idea is to minimize material moves, repositioning, and cross traffic by thinking through the floor, wall, and roof framing prior to starting the work.